Leave it to a femme-powered brand to take one more step toward lifting the taboo on personal care — and this time, you can file the results with your favorite clean beauty essentials. “Like so many of us, I loved facial oils to help retain a healthy glow — I thought, why can’t I use these on intimate skin?” shares Therese Clark as we discuss the “ah hah moment” that set Lady Suite into motion, her Cali-based brand that just debuted Lady Business, a chicly packaged combination of natural and certified organic botanical oils designed to beautify your most overlooked complexion. 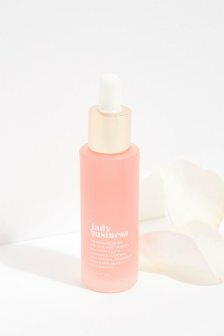 Aside from its multipurpose manipulations, Lady Business’s scent, “a combination of cedarwood and orange oils that have tested safe for this area,” and hue, a punchy watermelon created naturally by the recipe’s flowers, roots, and herbs, are a hit amongst fans — as well as within its own founder’s new routine. “Just getting into an intimate skin care ritual, like I have for the last two years, has been amazing. I feel strong, and more attuned to my health — and my intimate skin is glowing,” Clark shares of her personal strides toward what a well-balanced beauty regimen might look like in the future.